The Equine Grass Sickness Fund Chairman Philippa Gammell is delighted to announce that Mark Johnston, one of the UK’s most successful racehorse trainers, has become the Fund’s very first Ambassador. Mark trained as a vet at the Glasgow Veterinary School, but after three years in practice, decided to follow his heart into racing. In 1987 he gained his trainers licence and sent out his first winner, Hinari Video, and the following year set up his yard in Middleham, North Yorkshire. Since then he has achieved astonishing success, training more than 100 winners in 17 consecutive seasons, and winning the 1,000 and 2,000 Guineas, the Ascot Gold cup three times, and the Goodwood cup five times. 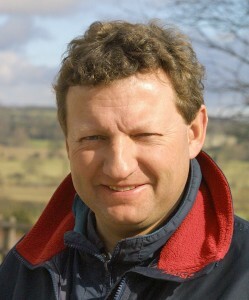 In 2009 Mark not only became the first Flat trainer to send out over 200 winners in a season, but did it all over again in 2010. Mister Baileys, one of Mark’s greatest horses, owned by Baileys Horse Feeds, gave both trainer and owner their first Classic win in the 2,000 Guineas at Newmarket in 1994, in a record time that still stands. Tragically Mister Baileys suffered chronic grass sickness as a three year old shortly afterwards, and is the most famous survivor of the disease. In spite of considerably reduced gut and liver function, Mister Baileys spent several years standing at stud, initially in the U.S., and later returned to the U.K. to the Whitsbury stud. Following retirement from stud duties he died at the age of 18.